Most high schools have a Mid-Semester Report sent out to parents to indicate to them how their child is progressing in each subject. It is usually compiled late in the term. Often, it is followed by a parent teacher evening that allows parents to discuss this report with the subject teacher. This reporting process has its difficulties often related to getting to know your new students. Sometimes, this is caused by the shortness of Term One and the very busy schedule of activities necessary to get the new year underway. Therefore, when it comes time to begin your First Term Mid-Semester Report you find yourself wondering which student belongs to a particular name. He/she is on your class list but try as you might you cannot put a face to the name. He/she has simply got 'under your radar'. Don't be alarmed. It usually happens in first year high school classes. You need to remember that you probably teach five classes consisting of up to 140 students that you need to get to know in a short time. That's one of our annual teaching challenges. 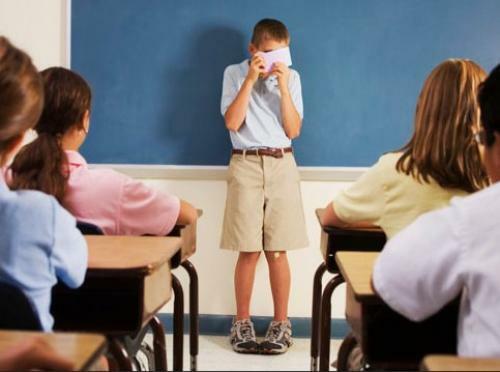 Usually, the student, often a boy, is a smallish, quiet ordinary looking person, probably one of three or four such people in your class. Often the student's results are about average. He/she is not disobedient; is never caught being apparently inattentive and rarely asks questions. Homework is probably being done; work is handed in as required. In other words, the student just tries not to be noticed and keeps out of trouble. They most often sit on the edges of the room, particularly near the back of the room and behind a larger person. That's how they remain largely unnoticed. There are strategies that you can adopt to make it easier for you to give a more accurate report on these students. Here are the strategies that I used during my career. Marking your roll and having the students raise their hand and answer the call starts the process of getting to know all the students. You could make notes on student features as you do this to help you remember them. Some schools have access to students' photographs. This can help. After a couple of weeks, try picking a student whose name you think you know and ask that person a question and see if the right person answers it. Create a class map with students' names to help the process. Use your class list systematically to ask all students questions. Early in the term, I discuss setting out in their working pads. A week or so later, I have each student come to my desk with their pad to check on their setting out. I ask, "How things are going and if they have any problems and so on". I make some notes on their progress so far. At the end of the teaching of each unit, I give the class a test which I mark, record their progress and return personally to each student, giving them advice to improve their results. I check homework during each period with the class, recording those students who have not done it or who have only given it 'lip service'. (I report on homework to parents). Then there is the official assessment program. The results in these form an important part of the reporting process. Every marked assessment item will contain written advice from me to the student on how to improve his/her performance. I will hand these assessment tasks back personally and discuss the results with the student. This gave me another opportunity to put a face to a name. I also record absences from class as frequent absences can have a dramatic impact on student progress. It is also important to record lateness with assignments and other assessment tasks. Some students are easily distracted or find concentration more difficult. Parents need to know this and what you have done to ease these problems. Record this in your diary. Early in the first term, I make it my business to read the students' record cards to get to know about their past results and so on. This helps give a picture as to whether or not these students are making progress. Now, if you are able to do most, if not all, of these strategies, then there will be no 'quiet lad' in your class that you do not know enough about to give an accurate report. Are You Thinking About Becoming a Teacher?